A couple of days ago we were lucky to catch a pair of Mourning Doves. We had all been sitting in front of the banding ‘lab’, the base of operations for the station, and watching a trio of doves wheeling and chasing each other about the cul-de-sac loop of the road in front. As we looked on, they suddenly swooped around and came down low, and then flew into the open net we could see from where we sat – bang-bang-bang (I say bang, but actually it’s a relatively gentle impact, as much as it can even be called an impact; maybe a better word would be ‘foop’, but foop-foop-foop doesn’t have the same sort of rapid-fire imagery). Myself and one of the other volunteers took off sprinting – Mourning Doves are large enough that they don’t typically stay caught long in a net designed for sparrows and warblers, and one of the three indeed escaped even as we madly dashed toward them. And the doves are caught rarely enough for them to be an interesting capture on a moderately slow day. 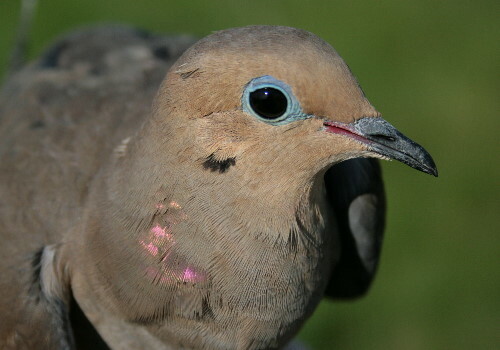 Have you ever taken some time to look closely at a Mourning Dove? They are lovely, sleek birds, with very soft, pleasing colours. We tend to think of them as just mouse-brown, but they embrace a broader palette than that. For one, there’s the soft blue orbital ring. The blue is actually coloured skin, rather than feathers. Then there’s the pink corners to the mouth, the overall effect as though they’re wearing eyeshadow and lipstick. 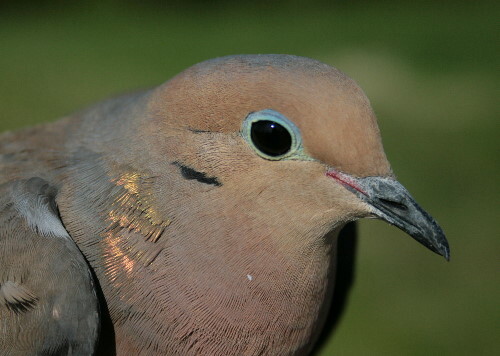 The male (above) can be told from the female (below) by the blue-gray wash over the back of his head and neck, and the dusty rose across his breast, which the female mostly lacks. (He’s also a bulkier bird than the female, although this usually requires a pair side-by-side to assess easily.) Both sexes sport an iridescent patch on the sides of their necks. Interestingly, the Birds of North America account indicates that males will usually show pink iridescence, while females will have olive-green, “although some pink iridescence occasionally occurs.” Perhaps they got their memos crossed? Pink does seem like a much more feminine colour, anyway. Great photos. Mourning Doves are one of my favorites. During the winter I have dozens that come to the feeder for sunflower seeds. The colors, patterns and behavior are all fascinating. However, it’s sometimes hard to take them seriously when you watch them march around on those bright pink legs. I adore mourning doves. Their beauty is subtle and their personalities are entertaining. This spring I enjoyed watching a pair successfully fledge two young right outside my patio. Couldn’t have been better. Great piece on an underrated bird. I have lately been enjoying the hawk-like flight of three mourning doves around here, and of course their moody calls in the evening. Funny that you mention pink and our association of that with femininity….I was thinking the other day, “When the hell did pink get associated with women and girls and blue for men and boys—when and how did those colors get ‘gendered’? Was it a marketing thing or what…and when did this occur?” I need to look into this, because it certainly did not come from the natural world….My hot pink John Deere bandana is what got me pondering this…. They’ve been visiting the (ground below the) mixed seed feeder recently, along with pigeons. I’d never noticed before how much smaller than pigeons the doves are. This is a common misconception, Mary. Putting out birdfeed of any type (seed, hummingbird nectar, etc) will not encourage a bird to stick around for the winter if it would ordinarily migrate. On the other hand, for species that spend the winter at your latitude, putting out a feeder will encourage them to hang around your house where you can enjoy them. Mourning Doves do overwinter at northern latitudes, so it’s perfectly fine that you keep putting feed out for them. We have about 6 mourning doves that sit on our window sill every morning for birdseed that I lay out there. They seem to enjoy it – I loved reading about the differences between male and female birds though as I always wondered. Now I know … thank you! My question is though, shouldn’t they be flying south for the winter? I don’t want to stop feeding them as I’m afraid they’ll starve but I also worry for them out in the cold as they won’t fit in the bird houses I’ve found…is there a bigger birdhouse you know of for them that I could put hay or something for warmth? Should they fly south? Is it ok that I still feed them? I live in Michigan and don’t want them to die…because I’m still feeding them.